Feel great when you arrive at your destination with these healthy tips. The Jumpstart Jettsetter mocktail from Virgin Airlines. There’s nothing worse than arriving to your destination bloated, sick and exhausted — except maybe without luggage. It’s easy to get lured into bad habits on the road, especially if you’re on vacation and tempted to indulge, not to mention plenty of high-fat and high-super options at every turn. Get the most out of your trip with four easy remedies that will leave you feeling your best when you arrive at your destination. You’ve heard it time and time again, it’s best to avoid alcohol before and during your flight, as tempting as that glass of vino is. Reason being flying alone is dehydrating, so mix in the dehydrating effects of alcohol means not only will you sleep poorly, but your jet-lag will be amplified upon arrival. One delicious-sounding beverage perfect for pre-flight is the Jumpstart Jettersetter mocktail, designed by Mark Murphy, Virgin Atlantic’s Food & Beverage Expert and former chef. 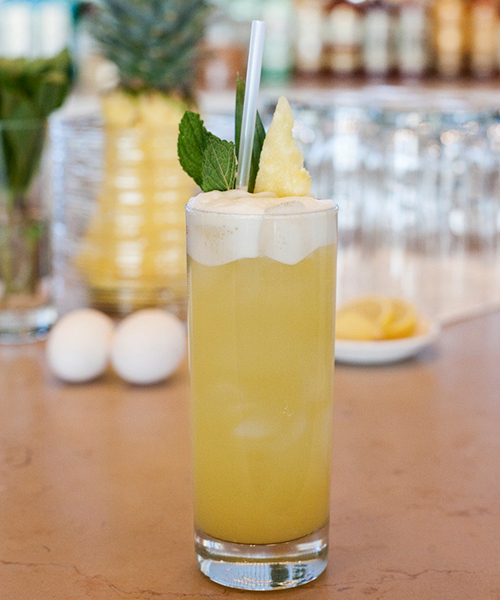 Available to Virgin Airlines Upper Class passengers travelling through their Clubhouses, the mocktail contains antioxidant-packed pineapple, fresh lemon, angostura bitters and mint to stimulate digestion, and is topped off with coconut water. We say yum! For those of us not flying first class on Virgin Airlines, you can create your own healthy beverage that you can drink before or during the flight that is easy to pack and very inexpensive. We suggest a caffeine-free lemon ginger tea, as ginger helps aid with digestion and lemon is soothing. Throw in an individually sealed packet of honey and you’ve got your own healthy concoction! Both Stash and Yogi, make tasty lemon ginger herbal teas. Forgot your tea at home? A mint tea at Starbucks is a good alternative, as mint is also known to help with digestion and is a soothing caffeine-free option. If you don’t already take a probiotic, frequent airplane travel is a good reason to start. Sitting so much increases bloating, creating pressure on your abdomen and interferes with regular digestion. Help keep your stomach happy by popping one or two probiotics during your flight, in addition to the days leading up to your travel and the day after. One challenge with probiotics is many need to be refrigerated. One solution is to just bring enough for your travels or try one that doesn’t require refrigeration, like Acidophilus Pearls by Enzymatic Therapy. While there are no conclusive studies that show vitamin C helps to boost your immunity, many frequent flyers swear by it. Even if you don’t buy into the hype, vitamin C does help with cortisol levels and prevent blood pressure from spiking during stressful situations — flight delays, customs and screaming babies anyone? We love carrying-on a packet of Emergen C, which contains 1,000 mg of vitamin C and comes in 20 varieties like raspberry, tropical and their classic super orange.